The result is a picture of the resemblance between the anatomy and the landscape. An earlier map, where the character is more defined, is represented below. The correlation is so clear, that the landscape can serve as a model for anatomy lessons. The face is the land between the Jordan River and the Mediterranean Sea. The Negev Plateau is the neck. 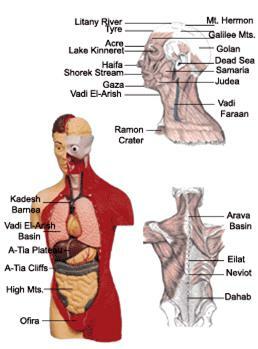 Sinai Peninsula is the torso. Jordan's Red Mountains are the hair. Lebanon's Mountains are angel's rays. When drawing the lines exactly on a physical map, the outcome is an 'embryonic' character. A free hand drawing can show a more realistic character. The face organs of the portrait appear in an external appearance. The torso organs appear in their internal appearance. This is in accord with the biblical meaning of the desert as a place of inspiration and revelation, and the fertile land as a place where moral laws come instead of the direct inspiration. The face part of the portrait is relatively long and the torso part is relatively wide. The artistic elongated form has a great influence on thought.  It creates the illusion of flight. It reaches upward toward heights and light. It is an image where the formal imagination and dynamic imagination intermingle, until the words become worn out. The elongated form is a formal daring. In the formal daring, the dynamic imagination regains its role as an inventor of shapes. 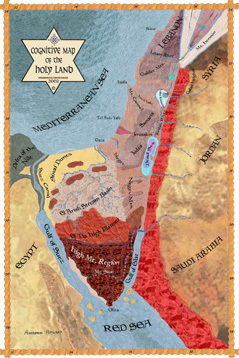 The Holy Land nickname as 'A Transit Land' receives a deeper meaning: It is a land of spiritual transitions. The illustration below shows the correlations between the body and the map. Near every body organ appears the geographic region name to which it is associated. Here is an earlier drawing, with more human characteristic lines. It illustrates the development of the portrait. With more details the look becomes more Geographic.